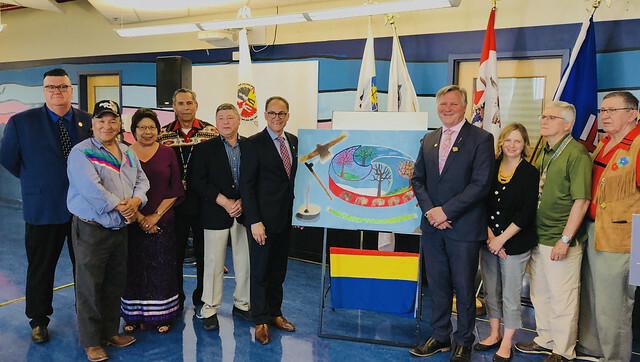 (L to R): Principal Fred Hines, Elder Fred Campiou, Elder Jeanette Lean, Elder Francis Whiskeyjack, Gerald Cunningham, Minister Ceci, Minister Feehan, Shelagh Dunn, Elder Leith Campbell and Elder Don Langford. As the government moves forward on the path to reconciliation, all current Alberta Public Service employees will participate in an in-person, one-day course over the next three years. The session will involve experiential learning with Elders through sharing circles, and participants will learn about Indigenous histories, residential schools, treaties and contemporary issues, and how they can apply what they learn to their work. Moving forward, the introductory training will be part of their job orientation for new public service staff. This is a fundamental step in the Alberta government’s work to implement the principles of the United Nations Declaration on the Rights of Indigenous Peoples. It also addresses one of the federal Truth and Reconciliation Commission calls to action. The training will lead to a more informed public service and is part of government’s commitment to renew its relationship with Indigenous peoples in Alberta as part of reconciliation efforts. The province engaged Indigenous organizations, communities and scholars to determine what the training should include and how best to deliver it. Indigenous culture was respected while drawing upon Indigenous wisdom and practices, such as sharing circles. In 2017, government engaged with a number of groups to inform the development of Indigenous training.